Day three aka the last day of BEA. I had two wonderful surprises. Author Da Chen sent me an email thanking me for posting about him and his wonderful autograph in my Day 1 highlights and offered to send me a copy of "My Last Empress" - I cannot wait to receive this book. I'm so intrigued by the story and can't wait to dive in. 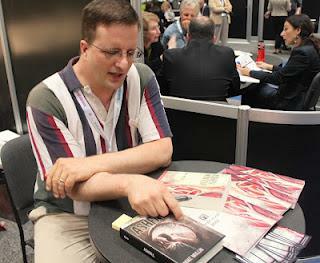 Second surprise, while strolling by the Perseus Booth, I felt compelled to go in and lo and behold, they were giving out copies of Fanny Merkin's (aka Andrew Shaffer) 50 Shades of Grey parody "50 Shames of Earl Grey" which I'd missed out on from Day 2. I started reading it straight away and it's just as ridiculously hilarious and silly as you would imagine. As this was the last day, I know the show closed early and while some booths were packing up, I was surprised to see there were several book and autograph signings going on up until the very end of Day 3. 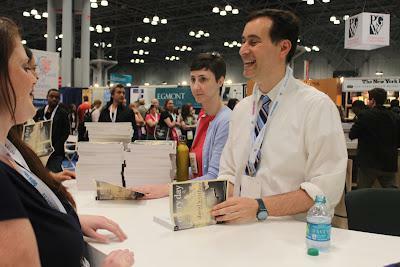 Author, David Levithan, young adult fiction writer and author of the book-turned movie, Nick and Norah's Infinite Playlist was on hand to sign copies of his newest book, "Every Day". 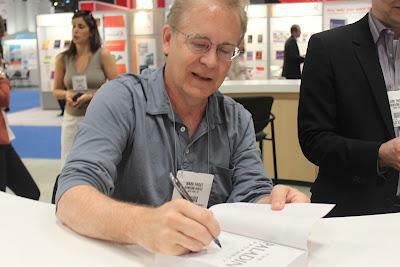 From there I saw another young adult fiction writer, Mike Mullins, who was signing copies of his newest release, "Ashen Winter", a follow up to his first novel, Ash Fall - about a teen struggling to survive and reunite with his family after a supervolcano eruption. 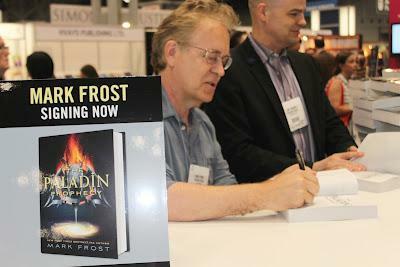 An exciting autograph session was NY Times Best Selling Author, Mark Frost, signing copies of his new book, "The Paladin Prophecy". Mr. Frost is a tv/film writer and director and is best known as a writer for Hill Street Blues, Fantastic 4: Rise of the Silver Surfer and co-creator of the show Twin Peaks. The Paladin Prophecy tells the story of Will West, a seemingly normal teenager who has unusual powers and who is careful to live his life under the radar as per his parents' instructions until one day he mistakenly scores "off the charts" on a nationwide exam. Getting this book was a great coup because an entertainment company has already bought the rights to it to make it into a movie to be released in 2014 which Mr. Frost will both write and exec produce. I will be reading this book next. As always, happy reading.